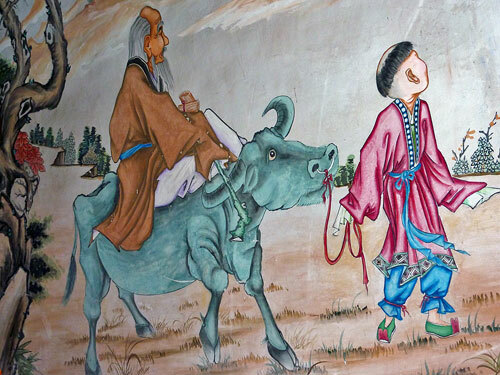 The Buddhist Haihui temple 海会寺where Minister Chen studied is just a short ride away from the castle and Guoyu village. However, our driver – even though he’s a local – has never been there and isn’t sure what it’s all about. As we approach the complex, along a mostly empty road, and stop at a grand but rather abandoned-looking entrance area, neither are we. 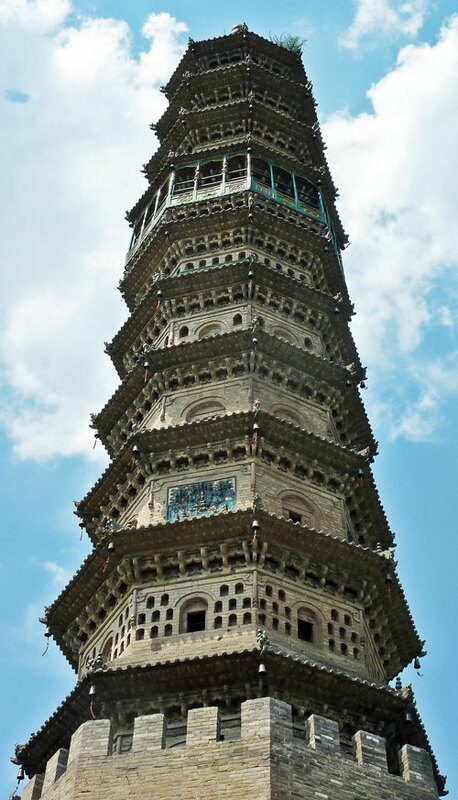 Should we fork out another 30 Yuan each, just to see two pagodas? Fortunately, we decide to go for it. 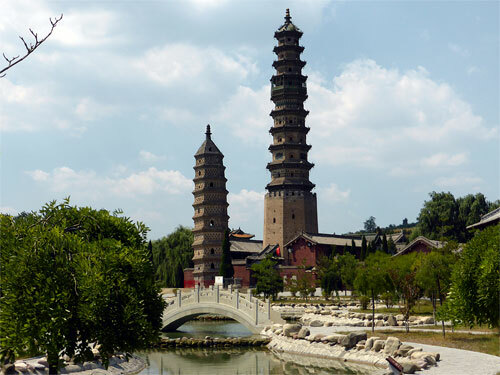 As the two pagodas come into view, at the back of a landscaped garden, we can see that they are truly magnificent. 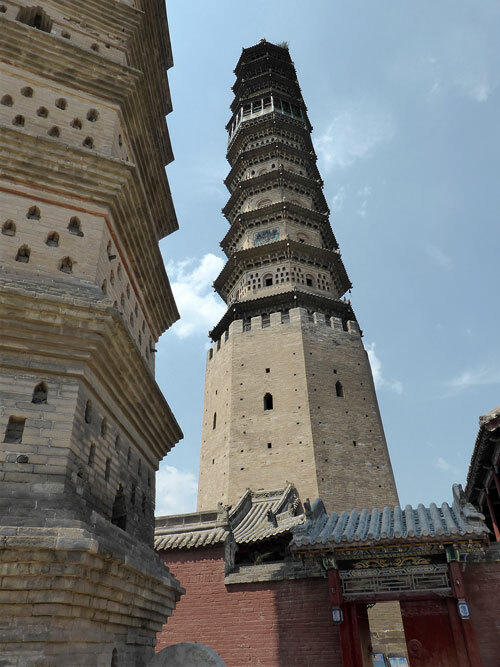 The shorter one, the 20-metre high and 1100-year-old Sheli Ta 舍利塔, is a harmonious, but simple construction. 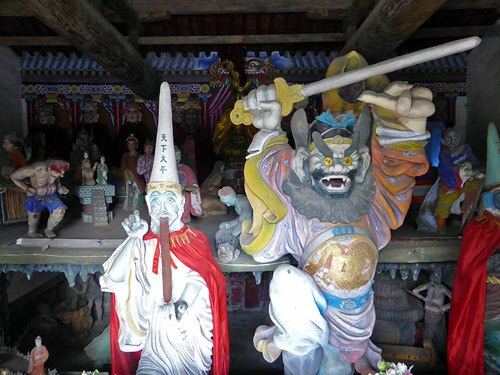 Its companion, the octagonal Rulai Ta 如来塔 which dates from 1558, is much higher and much more elaborately decorated. 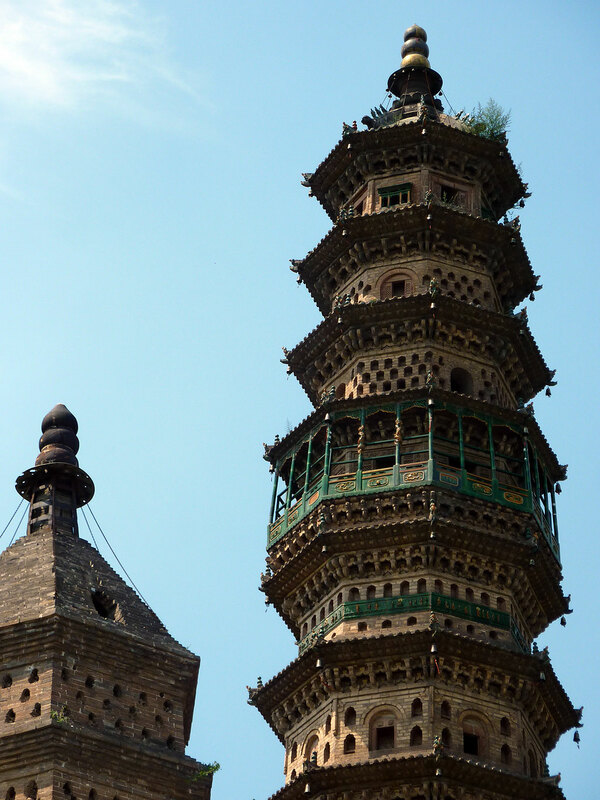 Somehow, being grouped together, each pagoda enhances and brings out the best of the other. 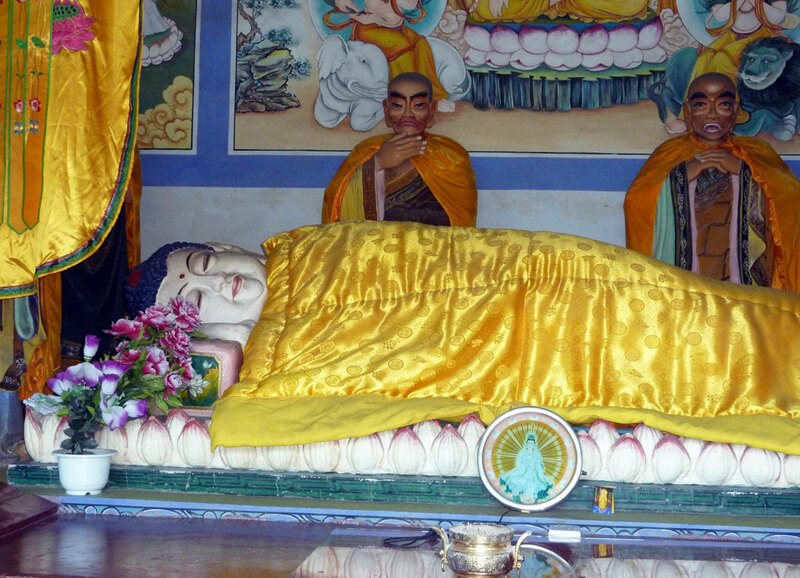 The Sheli Ta used to be called the Thousand Buddha Pagoda, as its many empty niches once contained images of the Buddha. Other than that, its brickwork façade is unadorned. 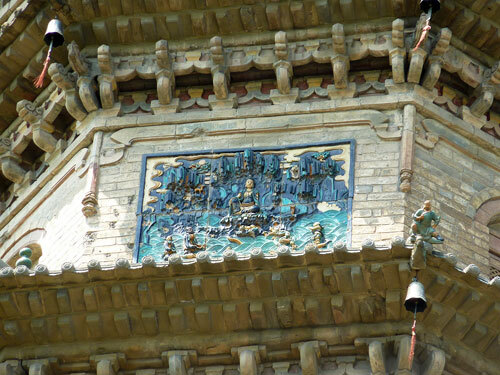 The Rulai Ta on the other hand is decorated with brick reliefs, some of which still preserve their turquoise glazing, and has small glazed figurines riding the eaves. Its 10th floor is surrounded by a carved wooden gallery, also painted turquoise, while the pagoda itself is topped by a golden ball. For an additional 10 Yuan you can climb up here and enjoy the views. However, when we visited there was nobody around to open the pagoda for us and we didn’t particularly fancy another climb anyway. 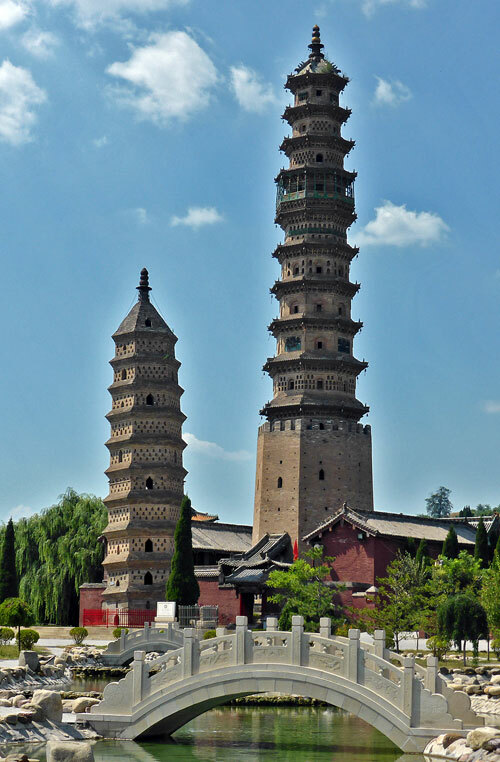 Of course, this being China, there is much more to the site than ‘just’ two incredible pagodas! There are extensive gardens, halls of study, and many temple halls. 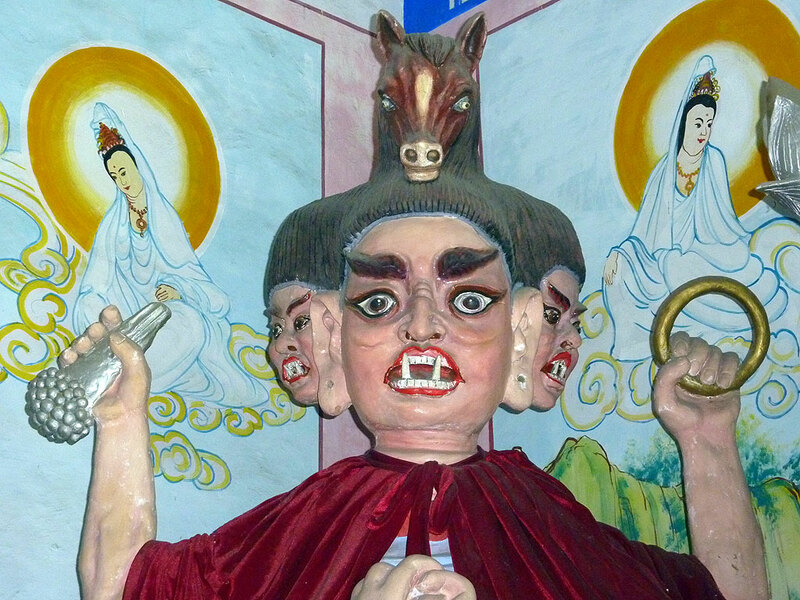 These contain curiosities such as a colourful but naïve fresco of Laotsi riding his buffalo, a Buddha sleeping peacefully underneath a yellow quilted blanket, a mustachioed goddess holding a baby, a fierce three-headed creature with vampire teeth, or a representation of Buddhist Hell. Then there seem to be places to drink special tea, or have a snack. We decide to give these a miss and head back to the entrance, where we have left our driver. 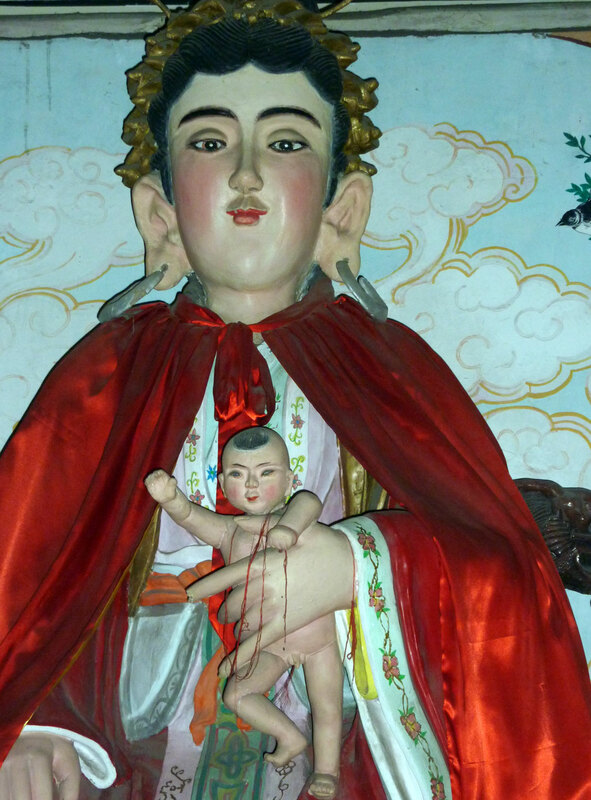 If you are coming by bus from Jincheng 晋城 then it is better to stop off first to see the Haihui Temple 海会寺 before going on to Prime Minister Chen’s Castle Huangcheng Xiangfu: 皇城相府 and Guoyu Village 郭峪古城. You can catch mini buses to the other sights afterwards. As we had hired a driver for the day we got him to stop at Haihui Temple after we had visited the previous two sights.